You are running several groups and teaching school-wide guidance lessons. Isn’t that everything? Not quite, new counselor. You need to create space for individual sessions. This is where you will work one-on-one with a child and help them implement strategies for success. Sound intimidating? Don’t worry, I’ve got you covered. Here are some first steps to take when planning individual sessions. Who will I see for individual sessions? You will likely receive referrals from teachers and possibly parents or the students themselves! Check out the referral form I use here. Oftentimes the SST team may refer students to see you as an intervention. Remember these are students who have the most intense need of your caseload. They have already received tier 1 guidance lessons and tier 2 small group counseling. An exception to this rule may be if they are coming in for a one-time occurrence (more on that below) or if they have a unique need so there are not other students to place them in a group with. When will I meet with my individual students? As always, it is important to get parent permission. Download this editable permission slip for free here. Once the permission slip is returned you can schedule a time that works best with their teacher. I recommend meeting with students for 20-30 minutes once a week for 6-8 weeks. You can then re-evaluate to see if the student needs continued sessions or an outside referral. Sometimes you may be asked to meet with a student regarding a specific situation. This is more of a “check-in”, you can talk with the student and decide if further counseling sessions are needed. My first year counseling, I saw some students weekly for almost the entire year. Their parents and teachers wanted them to continue seeing me. This was a mistake on my end as it is our role as school counselors to deliver short-term solution focused counseling. The students were very dependent on seeing me and if I was at my other site or out sick they didn’t handle it well. This can become especially problematic if you are not going to be at that school the following year. These students need a support system in place that is comprised of more than just you. After meeting with a student for an allotted amount of time, we need to assess what we are doing and decide if the student needs an outside referral or if they have progressed, move them to a lower tier intervention such as a group. (As listed in the ASCA School Counselor Competencies IV-C-3. School counselors engage in developmental counseling and short-term responsive counseling n IV-C-4. School counselors should refer students to district or community resources to meet more extensive needs such as long-term therapy or diagnoses of disorders). Your job as a school counselor is to put yourself out of a job. You want to equip the student with the skills they need to succeed in an academic and social emotional setting. Keep a folder with the student’s name on it. This is where you will track your sessions, keep worksheets they’ve completed, and keep papers for future activities. Check out my tips for staying organized in this video. What will I do with my individual students? During the first session, it is a good idea to keep it light and build rapport. Play some get to know you games and try to foster a relationship with the student. In the following sessions, start with a check in or warmup, then do an activity to cover a concept they are working on. Finish the session with some sort of reflection. You can also have students complete self-assessments during the first and last session to track progress and collect data. Check out the self-assessments I use here. 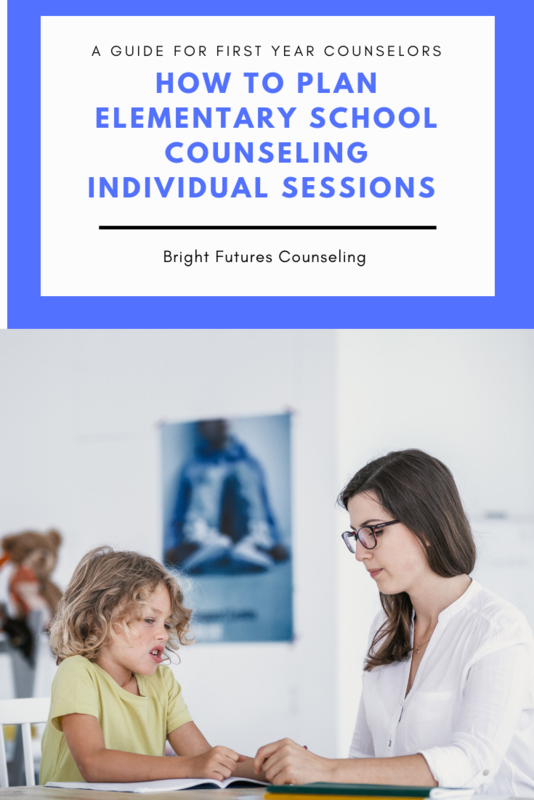 Individual sessions are a vital part of your school counseling program. I typically prefer groups because I am able to reach more kids in less time but the difference you can make with a child one-on-one is invaluable. You’ve got this! Comment below with activities you like to do in individual sessions. I’d love to know!